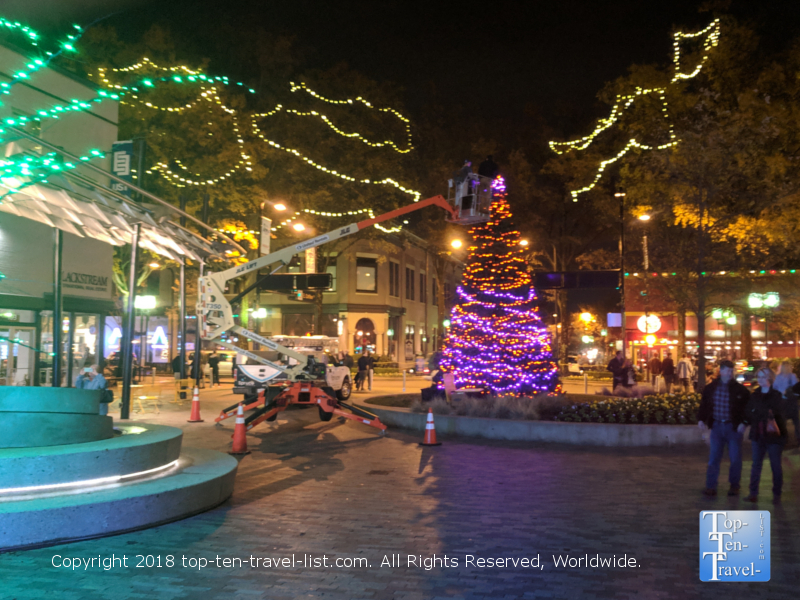 Unique Holiday Celebrations Across the Country - Top Ten Travel Blog | Our experiences traveling throughout the US. It’s that time of the year again. The malls are insane. The traffic is unbearable. Time to scrape ice off the car windows, shovel driveways, prepare for holiday entertaining, spend endless hours searching for the perfect gifts for everyone on your list, and so on and so forth. However, it’s also a great time of the year to escape the hustle & bustle for a while and enjoy winter sports, attend festive town light displays, and fill up your itinerary with nostalgic Christmas traditions. All these dazzling light events and attractions really provide a much needed break to counterbalance the more hectic parts of the holiday season, enabling you to relax & recapture the magic of the holiday season. In addition to all the standard zoo lights, ice rinks, and tree lightnings, I love seeking out oddball holiday attractions which are a bit outside the norm. Seeking out new and festive ways to celebrate the season is always exciting and a great way to stay motivated and energized during a stressful time of the year! Listed below are a few of the more interesting holiday traditions I have had the opportunity to enjoy. Check back frequently as I add more festive fun to the lineup! Uniqueness factor: It’s the only tumbleweed tree in the Southwest! You may have seen tumbleweed trees blowing in the wind as you drive through the dusty desert, however, these pesky desert shrubs make for quite an attractive Christmas tree. Every year, the fast growing Phoenix suburb of Chandler constructs an eclectic tree composed entirely of tumbleweeds. This Southwestern style tree is truly a unique sight that you will not find anywhere else in the country, and thus, definitely worthy of a visit if you are spending time in Phoenix over the holidays. This oddball tradition started back in 1957 when a resident saw a cone-shaped chicken wire with pine boughs stuck in the holes in Indiana. The city collects over 1000 tumbleweeds which are adorned to a 25 foot wire frame. The tumbleweeds are then spray painted and dusted with glitter. The tree is then lit with over 2500 lights, transforming from a dry, dusty SW tree by day into a beautiful illuminated display by night. A parade and tree lighting ceremony kick off the annual celebration. 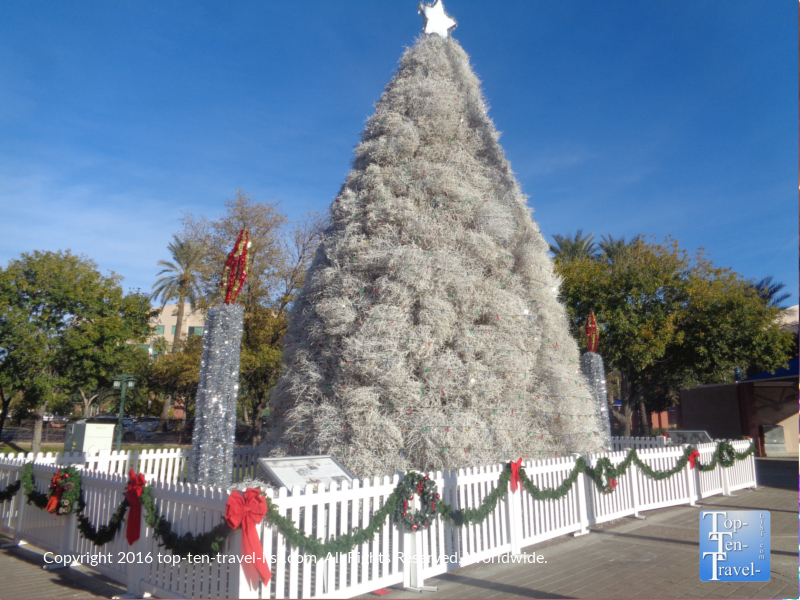 As it stands as the most unique Christmas tree tradition in the Southwest, the Chandler Tumbleweed tree is a definite Arizona holiday bucket list contender. Looking for a fun way to burn off some of those extra holiday calories? Something a bit different than your standard gym membership? Start training for a Santa Hustle race! 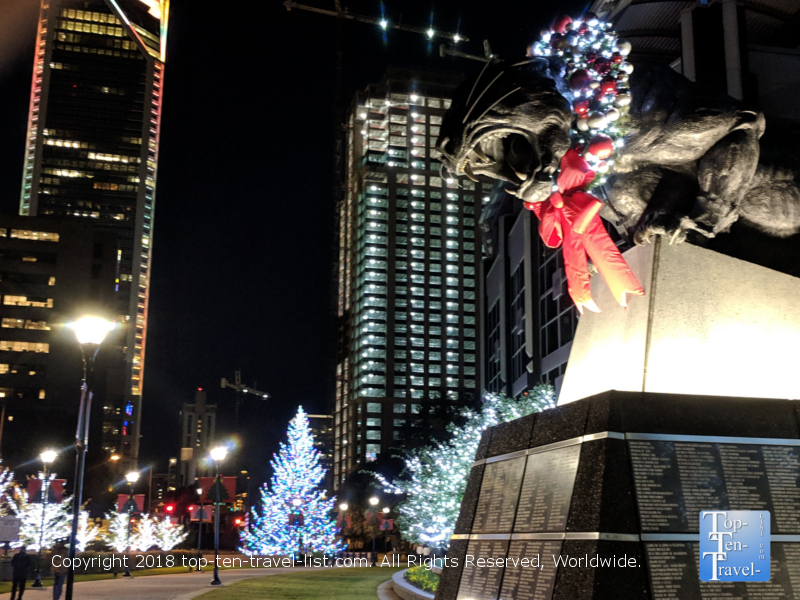 This festive race series, which takes place in various regions across the US, from the Windy City, to the Texas coast, to the Smoky Mountains, is the perfect way to get into the holiday spirit, while also getting in a bit of exercise in the process. Thousands of runners race down the street dressed as Santa, complete with hat and beard! A half marathon and 5k course distance are available, so both new and seasoned runners can enjoy the festivities. In the ultimate of holiday cheer, cookie and candy stations and holiday tunes along the course motivate beginning runners to push through. In terms of festive 5k races, the Santa Hustle series definitely takes the cake. Even the medal is Christmas themed each year! 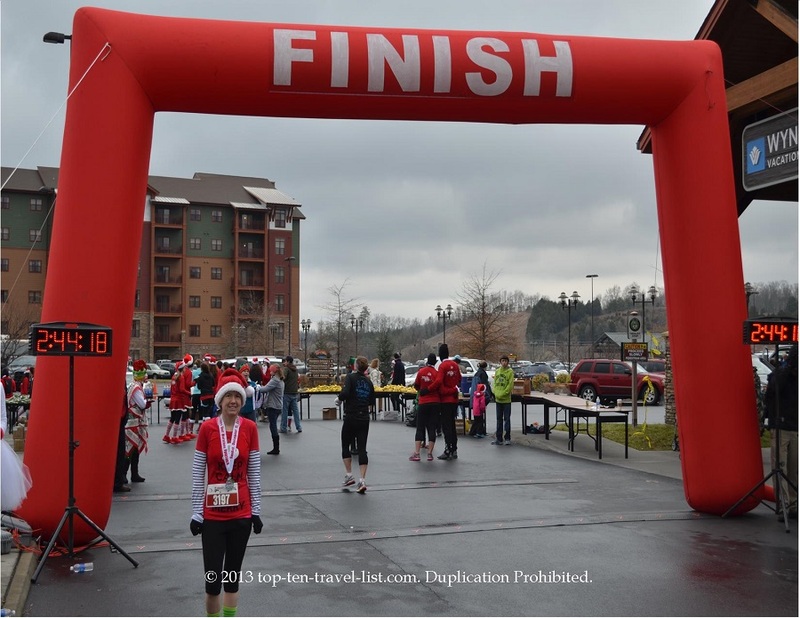 Bonus: when you sign up for this race, you will get discounted rates to the Wilderness at the Smokies, a great little resort with an indoor water park. Or better yet, stay in one of the gorgeous mountain themed cabins in the Smokies! Uniqueness factor: The Cleveland house was used for exterior scenes of Ralphie’s house. A Christmas Story is one of those timeless holiday classics which you can watch over and over again. While the film was originally a flop at the box office back in 1983, today this is no longer the case thanks in part to the popular 24/7 marathon on TBS every Christmas Eve. For those of us who grew up loving the movie, we were fans way before the film’s rise to popularity and would love to see where the movie was filmed. Fortunately, in 1996, Ralphie’s house (used for the exterior shots) was turned into a museum! 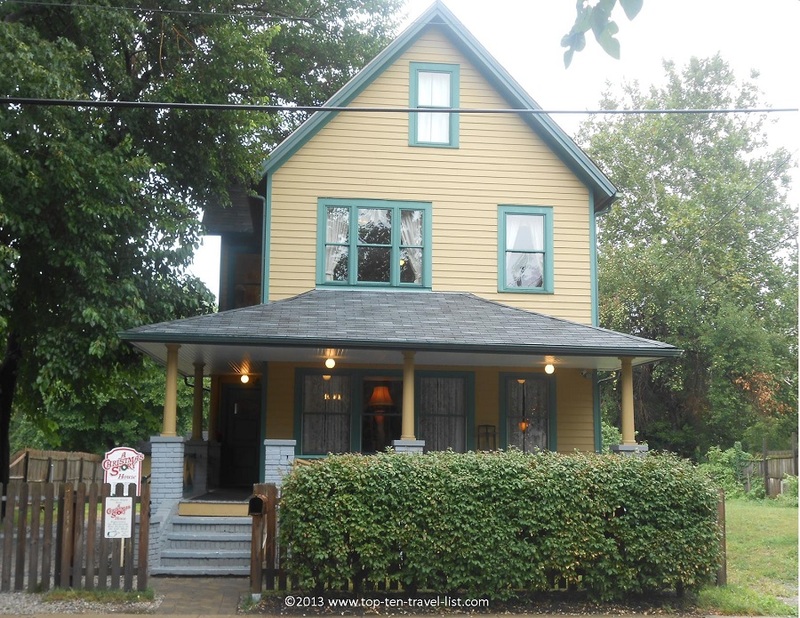 The house featured in the film is located on 11th Street just north of downtown Cleveland, and is open daily for tours. The staff is very knowledgeable with plenty of fun stories to share about the filming process. 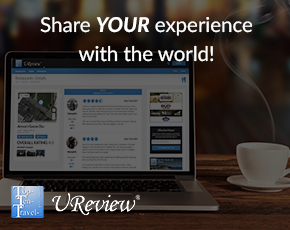 Besides strolling through the house which was modeled to look exactly like the film (right down to the leg lamp in the front room), you can browse around an amazing memorabilia museum and shop for unique souvenir gifts. Every year, the house hosts a really unique themed 5k race where runners go all out with crazy themed outfits – don’t be surprised if you see runners dressed in a bunny suit or leg lamp costume! Finishers receive free admission to the house, along with a special themed medal and t shirt. 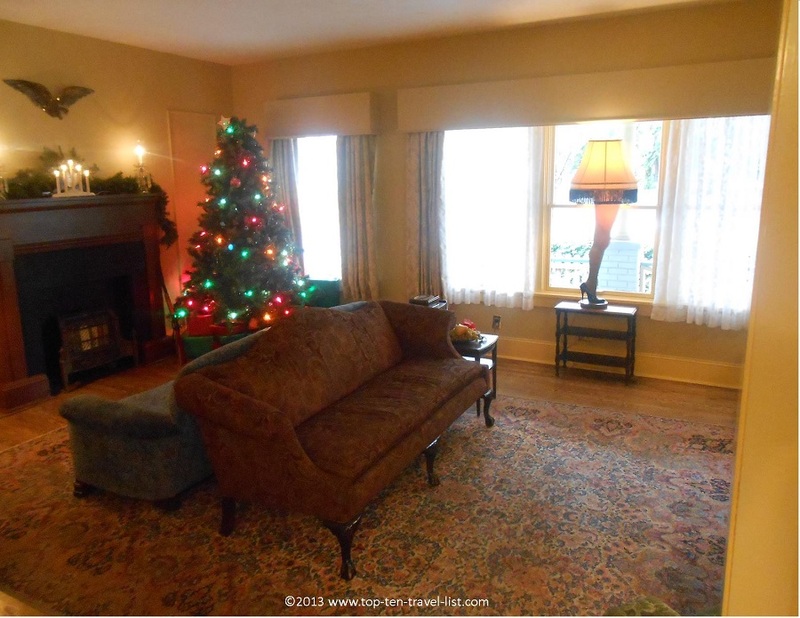 New this year, guests can stay overnight in the “Bumpus House,” located right next door! Uniqueness factor: Hundreds of rare gold & white poinsettias create a mesmerizing winter wonderland. 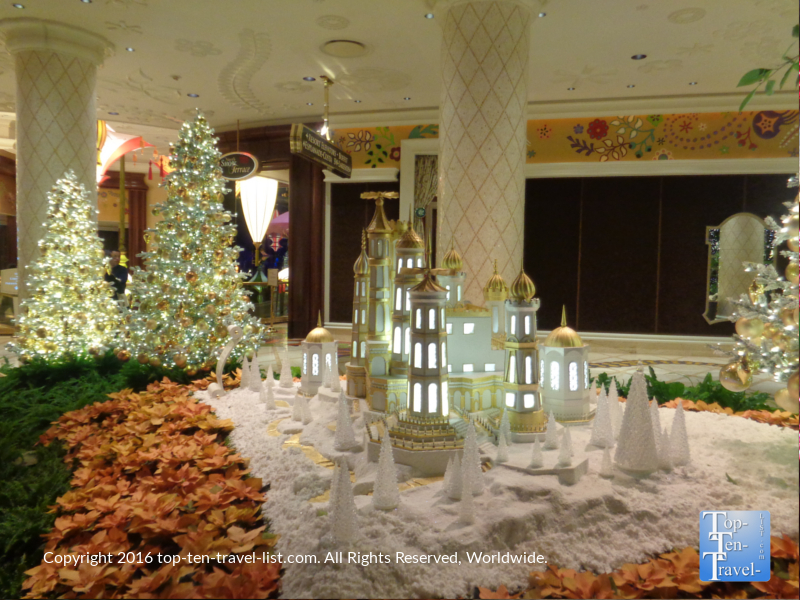 While the extravagant Bellagio gardens get most of the attention, the festive gardens at The Wynn are just as amazing. The Wynn Gardens display incorporates the use of hundreds of rare golden & white (Gold Rush & Princietta Max) poinsettias and dozens of eloquently decorated trees. The most recent display included mini villages shipped from Hong Kong, rare poinsettias, and beautiful trains, all with a gorgeous gold and silver theme. This display, although less flashy and not as popular as that of the Bellagio, really is just up to par. While at The Wynn be sure to indulge in the over-the-top Wynn Buffet, the best buffet in Vegas, featuring both an incredible setting and fantastic food. Uniqueness factor: The best cactus light display in the Southwest! The Ethel M Chocolate Factory in the Vegas suburb of Henderson hosts quite a unique tradition each year in their on-site botanical cactus garden. The 4 acre garden is one of the largest of its’ kind in the world. If you are up for leaving the Strip for a bit (I know it’s hard to leave the excitement – don’t worry this amazing display is worth your time! ), you will be treated to a walk through a most exotic holiday lights display. 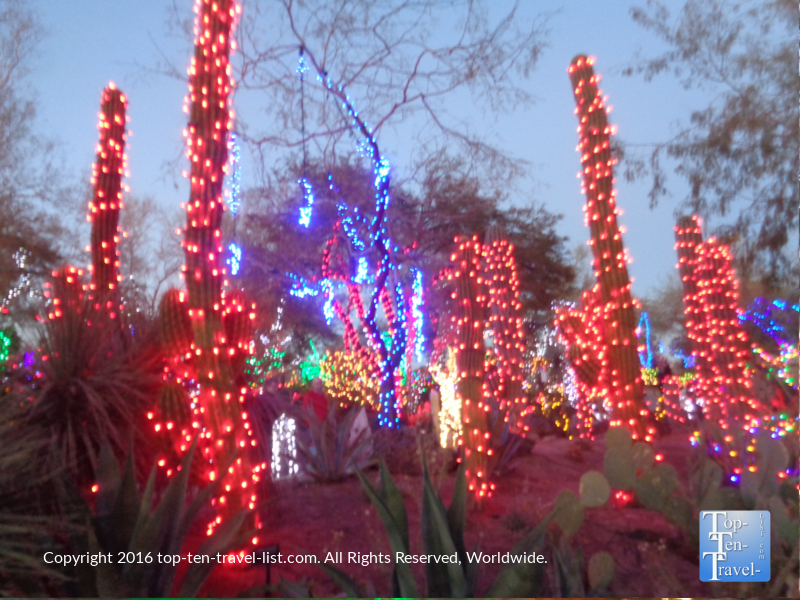 In the garden, you will find over half a million colorful lights creatively draped over 300 species of cactus. The result is beautiful, unique, and totally worth the drive or cab ride. Best of all, it will cost you absolutely nothing! While you are here, you can also tour the chocolate factory, sample sweets, and pick up a few unique gifts for loved ones! Uniqueness factor: One of the most over-the-top community light displays in the US! While many neighborhood associations put on a community-wide lights festival each year, few offer the pizzazz & dedication as that of the Winterhaven community of Tucson. This neighborhood goes all out in terms of decor with almost every single house getting into the excitement. What really sets this neighborhood’s display apart from so many others is the sheer creativity. Last year’s unique themes ranged from Christmas Vacation, to Stranger Things, to a A Christmas Story, to a U of A themed house. One house even had their own fountain show. At Winterhaven, your eyes will be treated to both timeless decorations, as well as fun extravagant over-the-top displays incorporating some of your favorite media themes, thus offering the best of both worlds. And that’s not all! On any given night, you may find carolers, plays, screenings of popular holiday classics, and so much more. You can even take a holiday hayride around the displays (for an extra fee)! The energy and excitement level really play a part in making this such a spectacular event. 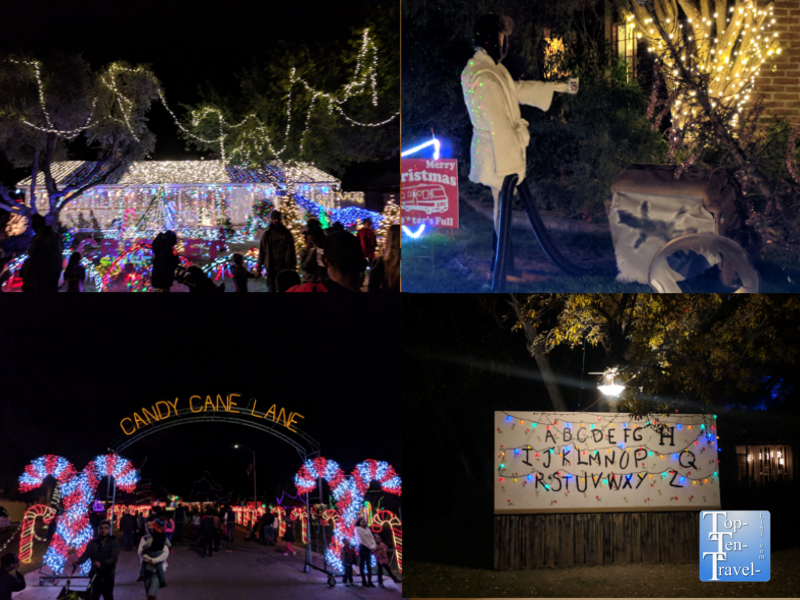 Winterhaven really is a memorable experience, rather than just a simple light display, and thus, the must-do for anyone visiting the Southern Arizona region this time of year. And, most important of all, donations and food are collected at the entrance. Last year, Winterhaven collected over $23,000 and 49,000 pounds of food! Uniqueness factor: This display features 34,000 flowers, 28,000 of which are poinsettias! Every December, the gorgeous 14,000 square foot Bellagio Conservatory is transformed into a winter wonderland. 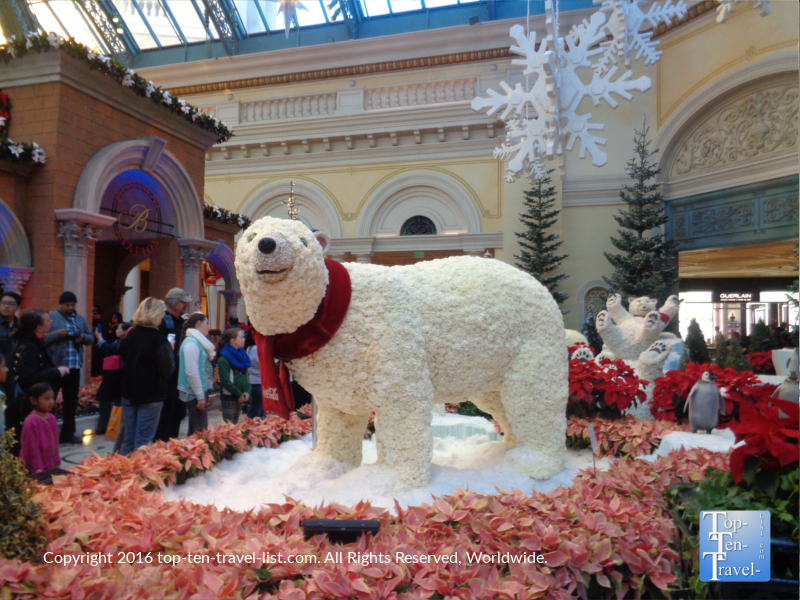 A staff of 120 horticulturists is needed to maintain this intricate display which includes polar bears constructed of over 12,000 white carnations. Featuring a 40 foot tree with over 2500 ornaments, 28,000 poinsettias, along with special displays each year (the 2018 display features 14 foot toy soldiers), this is definitely the not-to-be missed Christmas display in Vegas! The gardens change 4 times throughout the year, reflecting the changing colors and atmosphere of each passing season. Although the gardens are beautiful anytime of the year, they are particularly magical around the holidays. While you are at the Bellagio, be sure to check out the wonderful fountain show. This choreographed masterpiece includes a number of holiday songs in the lineup beginning in November! Uniqueness factor: The rare opportunity to see snow in Florida! Who says a White Christmas is impossible in Florida? 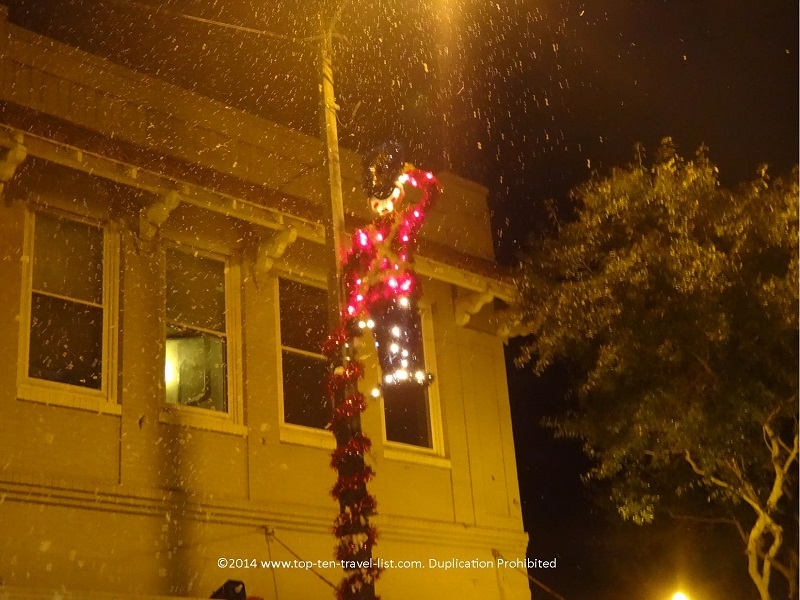 On the contrary, there are a number of festive snow events every season, especially in the Tampa Bay metro region. The best-of-the-best is the annual There’s Snow Place like Tarpon Springs, located in the small Gulf side community of Tarpon Springs about 40 minutes north of Tampa. This event is super festive & wintry with falling snow, a snow play area with over 20 tons of snow, a snow slide, a lighted boat parade, carriage rides, and more! It’s impossible not to get into the holiday spirit with all the festivities on the lineup. This event just goes to prove that you do not need cold weather to feel like it’s Christmas! While the forecast may call for sunny skies and mild 70 degree temps, the feel-good vibe of the holiday season is in the air in Tarpon Springs. Sledding in Florida? 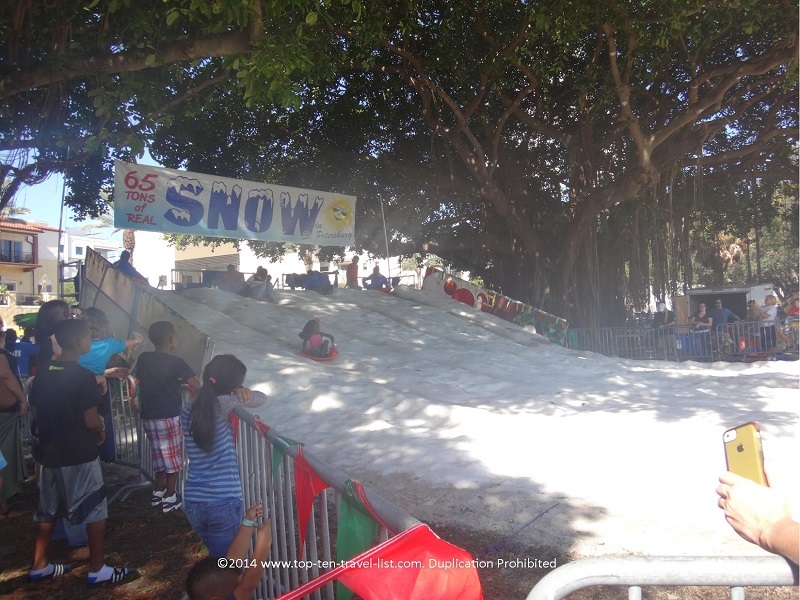 Sure there are plenty fake snow events in Florida, but in one city, you can actually sled down a real snow hill. Snowfest is a local’s favorite in St. Petersburg for the unique opportunity to sled down a hill made out of 64 tons of the white stuff. For all those transplants missing a traditional winter up North, this is the closest you can get to the real experience! Uniqueness factor: It’s the most beautiful ice rink in the country! Skating on Nestlenook Farms beautiful Victorian style ice rink is like being transported into a wintry snow globe. 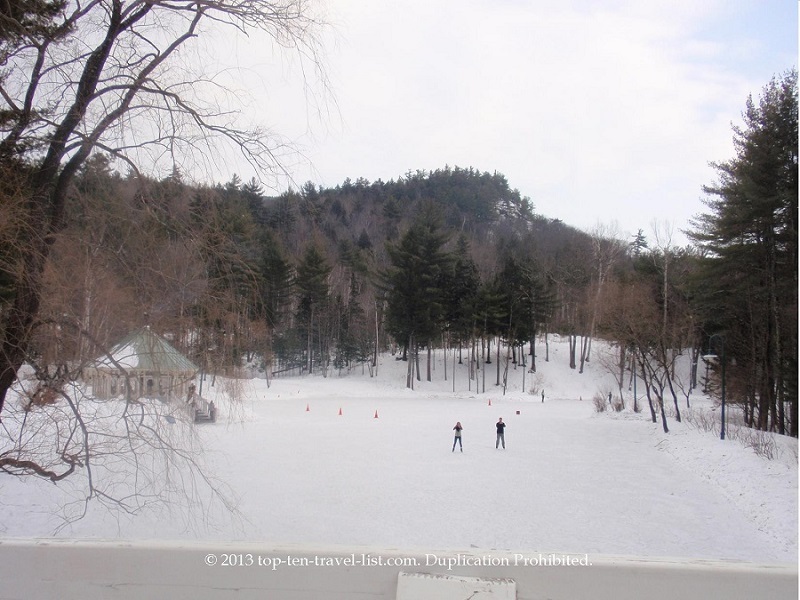 Anyone who loves ice skating needs to place Nestlenook Farms high up on their winter bucket list. The gorgeous 3 acre rink, reminiscent of scene straight out of Currier and Ives, is located on serene Emerald Lake in Jackson, New Hampshire. The beautiful backdrop of the snowy White Mountains creates the picture-perfect winter wonderland setting. In between skating sessions, you can warm up with a hot cocoa next to a roaring fire in the warming hut. Also on-site is the most festive sleigh ride. Your journey begins in a custom made Austrian sleigh complete with cozy fur blankets as you make your way around the serene grounds of the 65 acre Victorian estate. Sleigh bells are jingling, skaters are gliding by, all while old-fashioned chime music lingers on in the background. After your ride, you can explore the on-site snowshoeing trails and then warm up with a hot cocoa by the firepit. 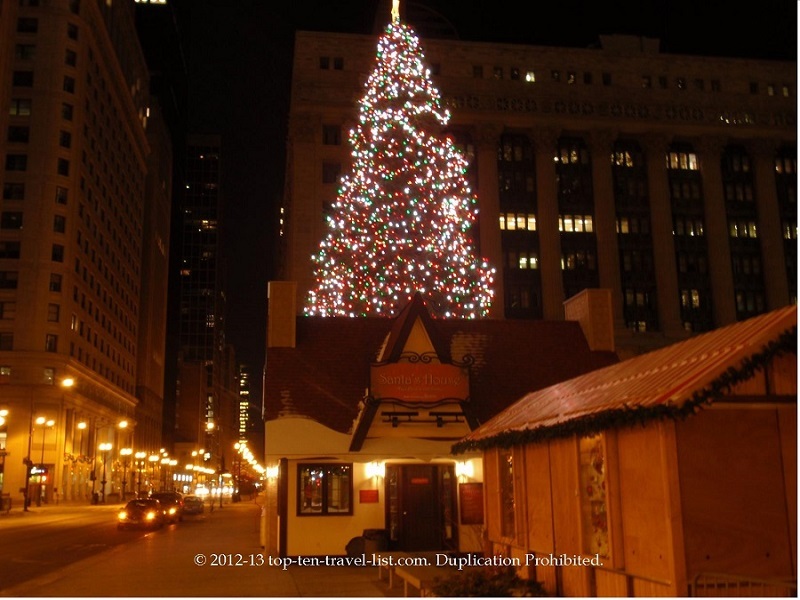 Chriskindlmarket is one of the most beloved Christmas traditions in all of Chicagoland. Since 1996, Daley Plaza downtown has been hosting the German style open-air market. This unique market is modeled after Christkindlesmarkt in Nuremberg, Germany, a street market which began in 1545. Chicago’s version is now the largest seasonal holiday market in the country, drawing in over a million visitors per year! At this festive fair, you can stroll around taking in the beautiful decor as you shop for handmade glass blown ornaments, old-fashioned nutcrackers, beer steins, and much more. And of course, you can treat yourself to all sorts of traditional German fare including Bratwurst, potato pancakes, Strudel, and Glühwein, a traditional holiday hot spiced wine. Admission is free and the market is located right next to the huge city tree. Also within walkable distance is the fantastic Millennium Park ice rink and the iconic holiday windows at Macy’s. Uniqueness factor: The annual wreathing of the lions the day after Thanksgiving kicks off the holiday season in one of the country’s best Christmas cities. 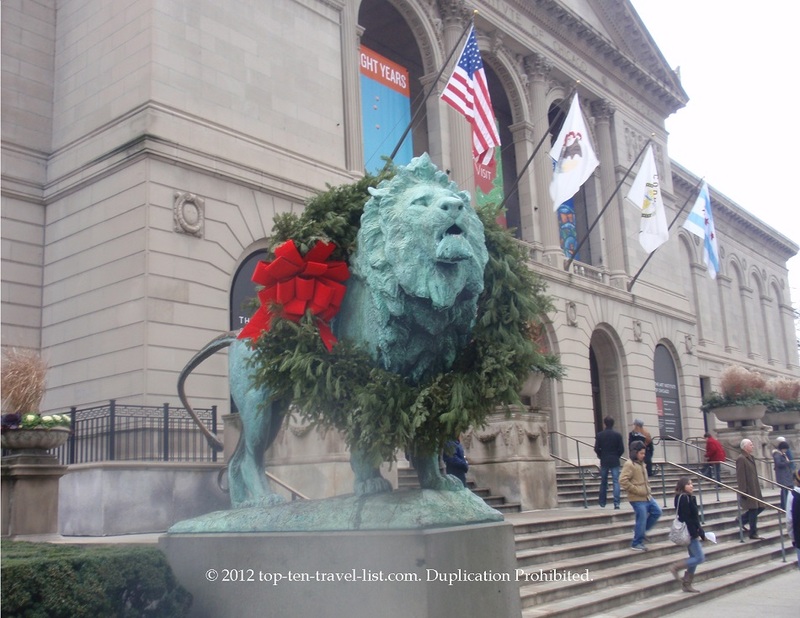 If you have ever strolled around downtown Chicago during the winter season, you have probably noticed the big beautiful wreaths adorning the lions which stand outside the entrance to The Art Institute. 2018 marked the 27th anniversary of the “Wreathing of the Lions,” a popular local tradition which draws huge crowds each November. The event features live entertainment and complimentary hot chocolate. Don’t worry if you cannot get here for the actual ceremony as the lions remain dressed in their holiday apparel through the New Year. And while you are here, be sure to check out the museum, home to over 300,000 works of art, and recently honored as the best museum in the world. Downtown Charlotte’s Bank of America Stadium also hosts a unique wreathing tradition each year. The Panthers in front of the stadium are dressed in festive gear each season. Also quite impressive is the annual Panther’s Christmas tree, a massive 60 foot Norway spruce with over 60,000 lights. Uniqueness Factor: The tree is decked out in the Clemson colors (purple and orange). Downtown Greenville is known for its’ many eclectic shops and restaurants. With Clemson being in the area, it’s no surprise that the popular football team has a Tiger Sports team shop downtown. Every Christmas, there is a huge tree adorned with Clemson team color lights. For every college football fan out there, it’s a must if you happen to be visiting downtown Greenville. Other holiday events in Greenville include Ice Skating on Main Street ( one of the only real rinks in the state! ), the annual Festival of Trees (over 80 beautifully decorated trees across 4 hotels), and the festive Poinsettia Parade. Uniqueness factor: It’s the largest gingerbread competition in the country! 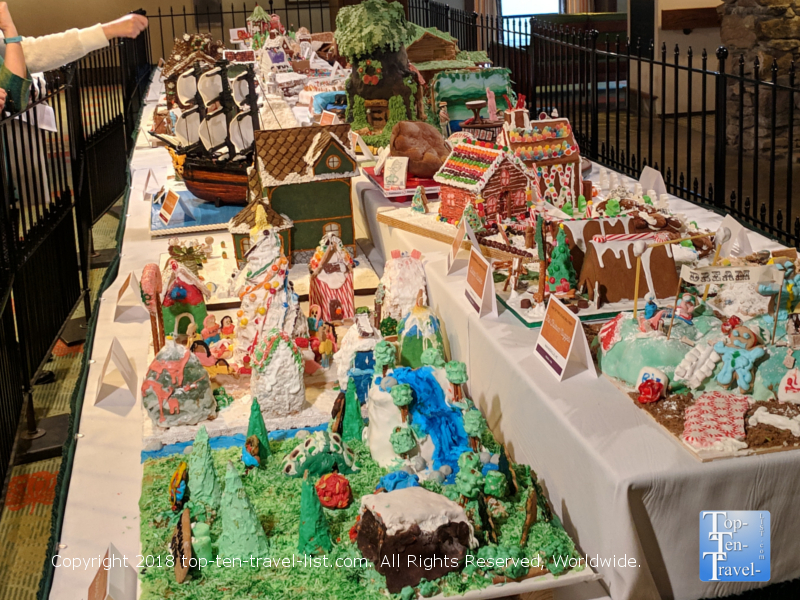 2018 marks the 26th year of the grand National Gingerbread Competition, held each year at the beautiful Omni Park Grove resort in Asheville, North Carolina. This event has grown massively since its inception and now attracts top knotch talent (and judges) from around the country. All of the houses are incredibly creative and 100% edible (and at least 75% gingerbread). Many of the houses are really extravagant, requiring a precise attention to detail that’s really impossible to imagine. Most of the entries are eclectic with everything, from a monopoly board game, to a cuckoo clock, to reindeers playing a game of poker. These are anything but ordinary gingerbread houses. The 2018 winner was an amazing imaginative recreation of Santa’s workshop. The public is invited to view the entries the entire month of December. 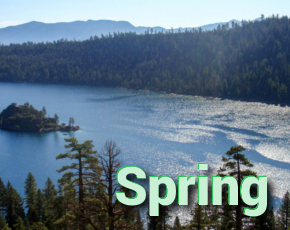 If you are not staying at the resort, you will need to pay a $20 parking fee (don’t worry -it’s worth it). Or better yet, plan for a night at the gorgeous Omni property which features stunning views of the Blue Ridge mountains, gorgeous rustic touches including massive fireplaces, an incredible spa, and plenty of festive decor for the holidays.